Giant Space Vegetables Now On Earth! Giant space vegetables grown from seeds sent into space have been grown in China. As reported in Technovelgy in 2006, 2,000 seeds were blasted into space in a Shijan 8 satellite (see Chinese 'Seed Satellite'). After germinating, the best seeds were then selected for further breeding. 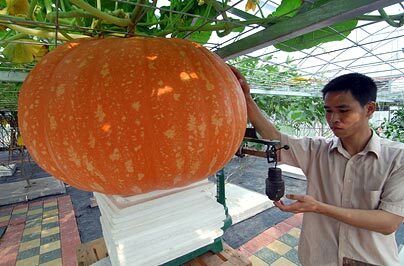 The large pumpkin shown above is joined by two-foot long cucumbers, fourteen pound aubergines and chili plants that resemble small trees. Looks like you might want to order the small-sized portion of take-out the next time you are in orbit (see International Space Station To Get Japanese Take-Out). The plants are claimed to offer harvests that are higher than normal; important news for a country with limited arable land and 1.3 billion people. The bulbous lifezones - huge bubbles extruded from the sleek lines of the Argo, like immense, bruised bodies of parasites. Inside, their opalescent walls ran with dewdrops, shimmering moist jewels hanging a bare finger's width away from hard vacuum. Via Could space vegetables feed the world? ; thanks to Moira for the story tip.